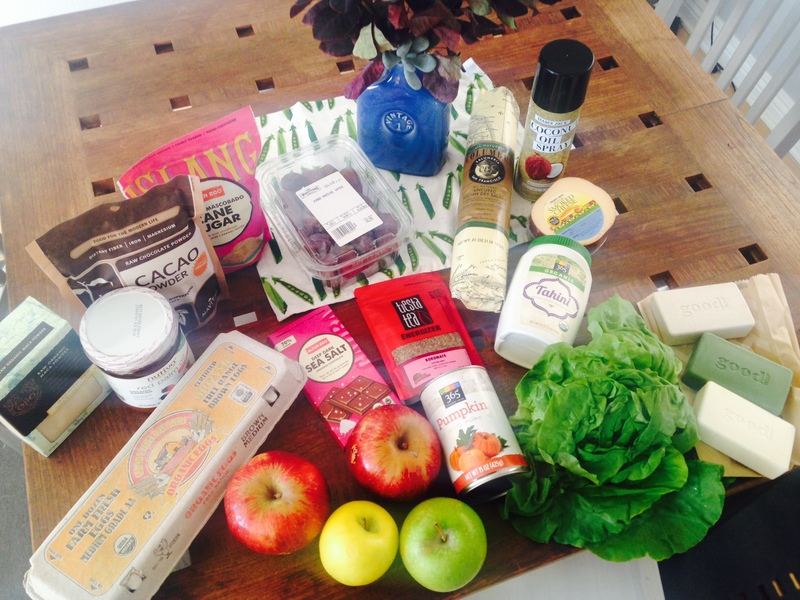 The first installment of “What’s in my Grocery Basket?” was a great success, so here we are again! Another week, another grocery trip. I revisiting my new discovery, Wholesome Choice and my regulars Whole Foods and Trader Joe’s. Smoked Gouda Cheese. A request from my Hunny. I am lac-tarded. Coconut Oil Cooking Spray. Also a request. I like using it when making paleo breads or muffins, but for cooking oil I usually throw a big blob of fat in the pan. Giant Log o’ Salami. This signals the beginning of Holiday time at TJ’s. I remember grabbing this last year around this time. I love salami, but it oftentimes has weird ingredients. This one is a great price and clean eating. Green Apple. to slice and eat in lettuce wraps with the aforementioned salami and some spicy mustard. Post-Workout winner! A lot of this shop was motivated by future culinary projects. I have a Fat Fudge in the works, home-brew Kombucha, and some baked goods for a Chiropractic Office in the queue. Medjool Dates. What a fantastic price for a giant container of Medjool Dates. TJ’s is my typical stop for this, but this international market has the value for sure. For my paleo brownies. Tiesta Tea, Kokomaté. Well this looks fun! It’s a loose tea with Yerba Maté, Rooibos, Coconut, and Cinnamon. Super fantastic since coffee has been making me feel sick lately. Alter Eco Dark Chocolate with Sea Salt. Another fantastic chocolate with no soy weirdness. Anything with sea salt wins. Chino Farms Eggs. Pro Tip: The Nichols brand eggs at Trader Joe’s are these same eggs for less money. They aren’t labelled organic or cage-free, but that’s part of TJ’s mysterious labeling charm. You’re welcome. Red Delicious and Golden Delicious Apples. These looked great and for a great price but ended up being super mushy. Cacao Powder from Navitas. I’ve been wanting to use more cacao over cocoa lately. Just seems like a more nutrient dense choice. Not cheap, but better than WF for reals. Raw Organic Maca Powder. Also needed this for my FAT Fudge and I love the great hormonal benefits of maca. Also great for coffee alternative drinks. I mix it in with my Golden Milk or Homemade Cashew Milk. WC: $8.99 for 8 oz. Nutiva Organic Red Palm Oil. Fat Fudge often calls for grass-fed butter or ghee, but since dairy is not welcome in my belly i decided to go for the buttery-flavored red palm oil. High in Vitamin E (like nuts and seeds) and Carotenoids (like carrots, yams, and orange-colored squash). It’s also nice to mix up the cooking oils from time to time. Raw Mascobado Cane Sugar. Thought I’d try it out for my new kombucha brew. Last stop was my beloved Whole Foods. I love this place, but man… it loses a lot of the pice wars. Tone it down you guys! Canned Pumpkin. Best price I’ve seen. Not necessary to be organic. Good Bar Soaps in Holiday Pine, Vanilla Peppermint, and Lavender. As if you need more of an explanation. I love clean skin products as much as clean food. These bars are made with Shea Butter, one of my favorite skin products. Butter Lettuce. For burgers, salad, whatev.